As one of the nation’s leading academic medical centers and a regional resource for practicing physicians, UW Medicine offers a wide range of specialty services. 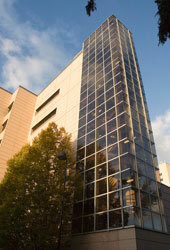 UW Medicine has almost 200 primary and specialty clinics and services located throughout the Puget Sound area. To find out what services we offer, please go to our clinic search page. To speak to someone in person about a referral to Harborview Medical Center, UW Medical Center or any of our clinics or services, please call the UW Medicine Contact Center at 1-877-520-5000 or 206-520-5000. For online referrals, use the Provider Referral Form.​ To refer by fax, print out and send the Referral Request (PDF) to the clinic fax number. To find the clinic fax number, search for the clinic from our Search Locations page. The UW Medicine Clinical Referral Directory is the most current listing of specialties and contact information for UW Medicine faculty clinicians. Use this directory, which is restricted to viewing by physicians and other healthcare providers, to contact a UW medical expert for a consultation or to refer your patient. U-Link is a free service that allows health-care professionals providing direct care to follow their patients’ progress by accessing the electronic medical records for patients at Harborview, UW Medical Center and the Seattle Cancer Care Alliance. Providers can print or copy portions of the record as needed. For information on how to refer a patient to UW Medical Center clinic or service, contact the UW Medical Center Physician Liaison Program at 206.598.5693. Patients may experience fatigue because their brain is working harder than it did before their brain injury. Recovering from related problems can also take energy to heal.